Congrats to the Pats on their 6th Super Bowl win!!!!! Check our February Events Calendar for updates about the Duck Boat Victory Parade! Want to know where to go to celebrate Super Bowl Sunday in Boston? The New England Patriots have made 6 trips to the Super Bowl since 2002 - and they will return again this year! Super Bowl is big in Boston, whether or not the Pats are playing - but when they are, the city sizzles with excitement! Can't bear to miss being at the game in person? Find where to get Super Bowl tickets, cheap flights, and hotel reservations. Staying in Boston? We recommend prime spots for viewing, cheering, and celebrating. Patriots fans will pack every sport bar in the city - and we have plenty of them! You can expect all the sports bars around Fenway and TD Garden to be packed, but with plenty of big screens, you'll have a good chance at a great view. 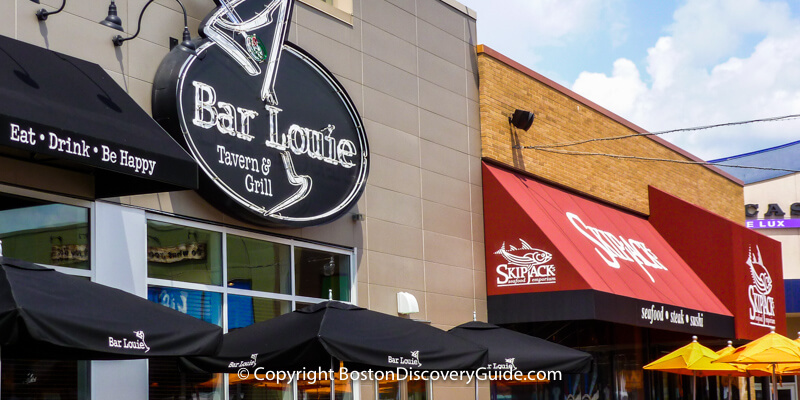 More sports bars in Boston. Don't forget to wear your Patriots gear, and come ready to have some serious fun! 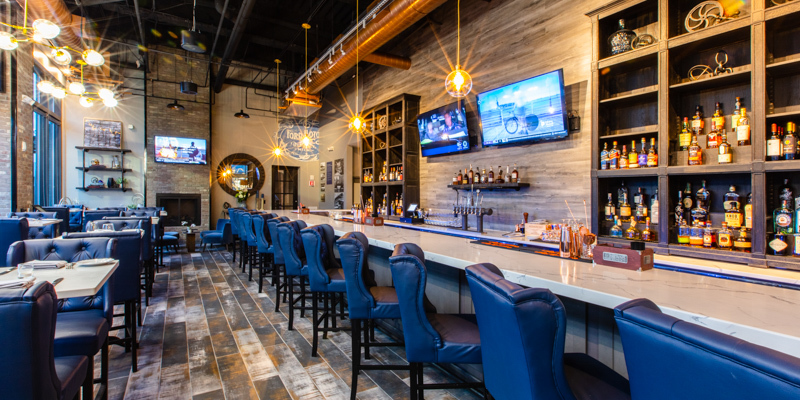 Want to avoid the crowds at Boston's sports bars but still watch the big game with like-minded folk in a convivial setting and perhaps enjoy a good meal? 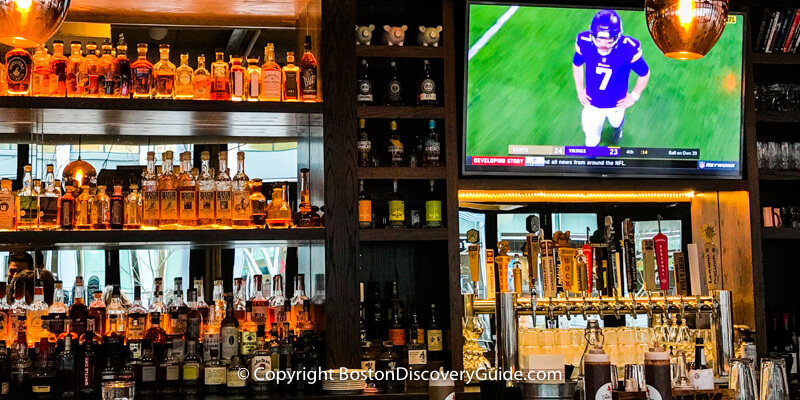 Virtually every restaurant in the city has a bar, and almost every bar in Boston has several or more big HD screens. Consult our guide to Boston restaurants by neighborhood and cuisine for more ideas. Hey, Super Bowl happens only once a year, and whether or not the Pats play in it, nothing beats watching it in person - so get your tickets and hop on a plane! Got your Super Bowl tickets? Now check out Priceline's last minute deals on flights. Book a hotel room and rental car while you're at it. Now all you have to do is pack your Patriots gear, hop on that plane, and get ready for a memorable experience! True, Super Bowl does not take place at Gillette Stadium - but you can still head down to Foxborough, have a tailgate party in the parking lot, and then watch the game at any of the great sports bars in Patriot Place next to Gillette. If you're planning to party, don't drive back to Boston unless you have a designated driver. Stay at the Renaissance Hotel at Patriot Place or one of the other nearby hotels. Since the Super Bowl is not at Gillette (but maybe some year? ), you should be able to get attractive rates. Let's face it - not everyone loves football, even if the Patriots are playing in the Super Bowl. If that describe you, you'll find plenty of reasons to enjoy Super Bowl in Sunday without seeing a single football player. Once the game starts, Boston will appear to be deserted, as long as you're not in a sports bar or anywhere else with a big screen. This is your chance to enjoy your favorite activities without having to compete with other fans for tickets, parking, or reservations. So check out schedules in Boston theaters, go ice skating on Frog Pond, head to a ski slope near Boston, or plan a leisurely dinner in your favorite restaurant. Just remember that once the game ends, people will surge out into the streets again - hopefully to celebrate! When Does Super Bowl Take Place? 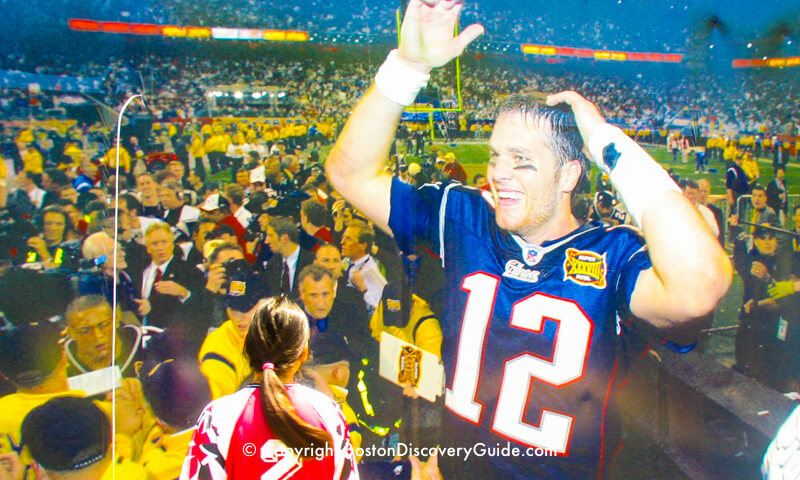 The date for Super Bowl varies each year - but you can easily predict when it will be. Just find the date for Labor Day, the first Monday in September. Super Bowl is always on a Sunday exactly 5 months away. So, for example, if Labor Day falls on Monday, September 3 in 2018, Super Bowl takes place on Sunday, February 3, 2019. New England Patriots Schedule - Don't miss any of their games! Check out all our tips on how to find discounts, deals, and promo codes for Boston hotels. Whether you're looking for bargain accommodations or want to pay less for luxury, we'll show you How to Save on Hotels in Boston. Whale Watching - Cruise out to see whales, dolphins, & more! Want to save on designer fashion at Boston's biggest discount mall located south of the city? Please note: Although we do our best to ensure that content on BostonDiscoveryGuide.com is accurate, information can change at any point without our knowledge. Boston Discovery Guide makes no representations or warranties with respect to any information, materials, or graphics on this website, all of which is provided on a strictly "as is" basis, without express or implied warranty of any kind. Copyright © 2008-2019 Boston Discovery Guide®. All rights reserved. Boston Discovery Guide® is a Registered Trademark. Content and original photos protected by DMCA.